As you spend more time at your holiday park it can be easy to let your guard drop when it comes to protecting your static caravan or lodge from thieves. Although crime on caravan parks is relatively low we do see a handful of claims for theft at this time of year and more so in the closed season. A holiday park can attract thieves who are on the look out for some easy pickings so it’s important to always be on your guard and considering adding that extra layer of protection. Always lock your doors and windows and make sure all locks are working correctly. Never leave keys hidden near your caravan or lodge. Close curtains at night and never leave valuables on view. Use a padlock on your outdoor sheds and outbuildings to protect the valuables you keep inside. Fit an alarm to your static caravan or lodge for that extra peace of mind and extra security. Here we look at some different kind of alarms – which will act as your first line of defence against criminals intent on stealing – but will also send out a warning to you, and others, that a break-in has taken place, as well as deterring the thief. Some alarms can be fitted yourself but if you don’t fancy doing it then speak to your park owner. It’s also worth checking if they have a particular system they would recommend for a static caravan, lodge or park home and if they’re happy for you to install an alarm. If you have an alarm, get into the habit of setting it when you leave your static caravan or lodge – even for a short time. Simple alarms can be cheap and easy to fit, but can often be disabled in seconds. Also, if your neighbours hear a siren for only a few seconds they usually assume it’s been accidentally set off. Adding stickers to your window will help to warn criminals that you have an alarm system fitted and can be a good visual deterrent. Features like “sleep mode” and/or “pet setting”, mean you and/or your pet won’t set off the alarm when you’re inside. Check power consumption and battery levels. You’ll want to make sure any batteries won’t run flat when your caravan is left for long periods. A motion sensor alarm system will make a noise to alert nearby people to an unauthorised access. However, as already mentioned the majority of break-ins happen when you’re away from your static caravan, meaning you’re relying on somebody being nearby to hear and react to the alarm. This battery powered wireless alarm system has a siren and flashing strobe when activated and looks like an easy alarm to install. A PIR sensor will detect movement inside your caravan, from up to 15 metres, and the kit also comes with two internal wireless magnetic door or window contacts, which will activate the alarm’s siren if a thief attempts to break in through your caravan windows or doors. No power supply is needed for this alarm. There’s a built in warning system to alert you if the battery power on is running low on the window/door sensors and PIR. 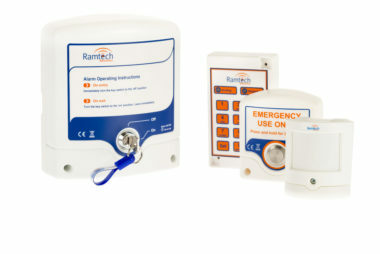 The alarm is activated by the two remote controls provided, and there’s an option to buy an additional wireless keypad. The siren is powered by 4 x D cell batteries (supplied), which will last approximately two years, and when triggered will transmit a 120 decibel alarm, plus bright flashing strobe lights. You can set how long this goes on for when it’s installed. Features also include: Panic button on the remote control, tamper protection, service mode and easy to follow installation and user instructions. Options to add more door and window contacts, PIRs, dummy sirens and wireless keypads. There are a number of alarms which will send you an alert via a landline or mobile phone, or even text message (SMS) if triggered. This allows you to contact the park or get back to your holiday caravan and check everything is okay. At the very least the alert will allow you to act quickly and re-secure the property to protect it from further damage. 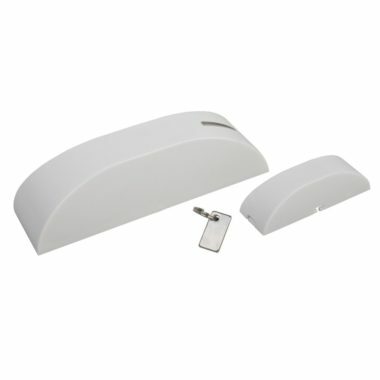 This simple alarm will provide adequate protection for your holiday caravan. The PIR alarm is fitted inside your static caravan or lodge and should anyone enter and trigger the motion sensor, the alarm will sound a 130db siren and send a text message to a preset mobile phone number, as well as dialling up to three numbers, leaving a pre-recorded message. There’s no wiring, making installation easy. It’s powered by 3 x AA batteries and a GSM SIM card is needed (not supplied). Features also include: Can be programmed to siren or silent mode, remote key fob for arming and disarming. 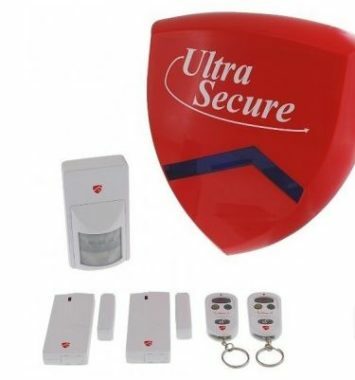 This alarm can be used on doors or windows to alert users when they’re opened by an intruder. Using mobile phone technology, if someone activates the sensor it will transmit an alert to up to six mobile phone numbers by SMS text or call the owner’s phone. The alarm is compatible with both iPhone and Android and is easily set up or changed by the Express GSM App and online configuration tool. 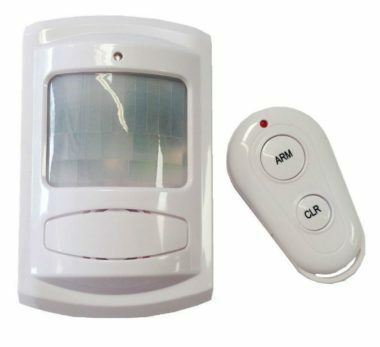 The Express GSM door alarm is battery powered by a 3V CR123 lithium battery and will run for at least one year between changes. It’s armed via a key chain magnet, which is included in the kit, with the wireless magnetic security sensor. Features also include: Security locked SIM card with £10 initial credit. Settings are programmable via a mobile phone, online or via their phone APPS, including disarming the alarm. Quick start guide. 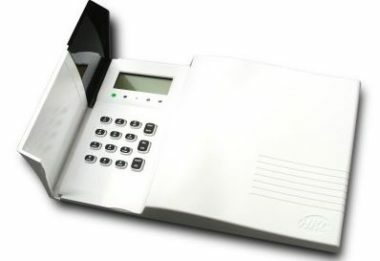 Effective alarm systems are the monitored varieties which alert the manager or holiday park security that there’s been a break-in, either by radio wave or mobile phone text technology. On receiving an alert the manager can check out what’s happened and take the necessary action. Monitoring equipment is bought by the park and then the park will sell individual alarm units to its customers. Many of these devices can even detect other hazards such as water, gas or carbon monoxide leaks and alert the park operator or static caravan owner. Ramtech say they’ve been setting the standard in holiday caravan monitoring systems for more than 25 years, and have alarm systems on a number of large holiday parks in the UK. For those parks who have a Ramtech alarm system installed, it provides a centrally monitored alarm network, monitoring every single alarm installed in holiday caravans on their park, 24-hours-a-day. You simply pay to have a wireless alarm installed and connected to the park’s system and once installed by a certified engineer, if your alarm is tripped, it will send a silent signal to Ramtech and your park’s security staff, so they can investigate. Features also include: A silent alarm so your neighbours aren’t disturbed, hourly check-in with the park system whoh detects any errors, such as low battery. Systems to suit your holiday caravan or lodge. Expect to pay: Speak to your park owner for costs. Crosby Intruder Alarms offer a range of wireless security alarm systems aimed at caravan parks to provide intruder and fire protection to holiday lodges and caravans. All their alarm systems can be controlled by their owner as well as sending alerts to a central base station, if there’s a problem. Radio based passive infra-red detectors are fitted to your holiday caravan and magnetic contacts can also be fitted to the doors and windows. The alarm can be operated from outside the caravan or lodge by using a hand held digital key. The HKC Quantum alarm system can be programmed to alert the holiday caravan owner and park security if the alarm has been activated via SMS text message or phone call, or if there’s a mains electric failure. Crosby also say their system is ideal for lodge or static owners who let out their holiday caravan. A computer tablet can be installed in the holiday park’s main office which records the alarm system’s activities and sends a notification to a Cloud Based App for the park manager, warden or security to respond to. Features also include: Wireless smoke, heat and carbon monoxide detectors, plus internal and external sounders. Individual configuration of the App. Of course even with good security in place thefts can still happen, which is why it’s important to have specialist static caravan insurance cover in place. Do you have an alarm system in your holiday caravan or lodge? Share your comments below. Most popular holiday caravan manufacturer revealed…. We have just finished designing a smart alarm which will be available in the next six weeks,the system contains the hub unit which is plugged into the main supply should there be a power cut the hub unit will go onto battery power.The hub unit is very versatile if the wifi signal goes down then it switches over to a special SIM card in the unit which scans for the strongest phone network and uses the same to monitor the system,so if you haven’t got wifi it doesn’t matter,you can add whatever you would like to the alarm itself,door contacts,Pirs,smoke detectors,carbon monoxide detectors,security cameras,all of these devices are battery powered which are high powered and last approx 12 months when a battery goes low the app sends you a message to your phone to replace it the system also has two alarm key fobs should you want to arm and disarm the alarm without using your phone,if you are not at your holiday home but want to check it go on the app put in your password and check your cameras every part of the system is monitored 24 / 7 by the app on your phone Android or IOS.if you need to notify park security this can also be done. Thanks for sharing John. Sounds like a good system.